It has been said that the best lies contain an element of truth to them. Torquil Campbell’s True Crime is built entirely out of this concept. It will leave you with an uncomfortable tension in your seat, but an eagerness to see it to the end. Despite being a one man play, Campbell never lets us feel like he is the same person. Using a small stage, a grid of lights, music and the plucking of a bass, Campbell absorbs us into his world. The play introduces us to its two main characters: Clark Rockefeller, an extravagantly extroverted figure who has a love of dogs; and our host, Torquil Campbell, an artist looking for his next muse before making a comeback into acting. The two men have many disturbing things in common, they both lived blocks away from each other in New York, they both have a daughter and more disturbingly, they look a-like and wear the same glasses. Campbell accompanies us slowly into his obsession with Rockefeller and his many lives, as Campbell struggles to understand the ethical implications of a relationship with Rockefeller. This culminates in a perhaps regrettable decision to visit Rockefeller in a Southern California jail, and the unraveling of our host’s mind as he becomes an entangled character in a true crime story. It isn’t a relatable story, and it isn’t meant to be. We are living exclusively through Torquil’s eyes and body as he narrates us through a unique experience where we can divulge our perversion into crime. The story manages to go above and beyond the expectations of a one man show and makes us emotionally invested and desperate to know its outcome. It manages to question what it means to sacrifice yourself for art, what it means to be entertained and question if you really know the people around you. 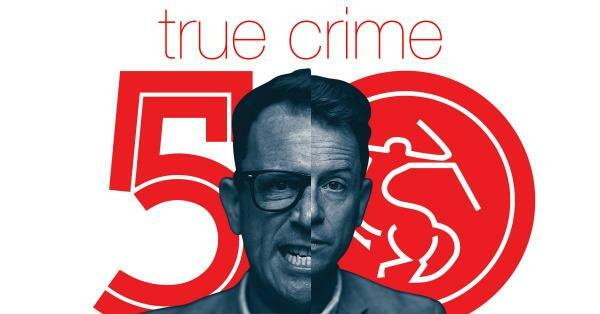 True Crime was presented at Centaur Theatre Jan 8 to 27.